Aging is an unfortunate process that all of us have to face sooner or later in our lives. The good news is there are many anti-aging creams that help to slow down or even reverse this aging process. One of the top anti-aging creams when it comes to a permanent reversal of the aging process is Stemuderm. Let's learn all about this natural cream and how it impacts our skin. Stemuderm is a concentrated anti-aging solution that works on all the many factors that lead to aging. Before we go on to the Stemuderm review, let's take a brief look at the aging process itself. We age because of several reasons, the two major of which are the reduced production of collagen and a slowdown in the growth of skin cells. When collagen production is reduced, it affects the elasticity of your skin and causes wrinkles. Likewise, when your skin cells stop growing, there is less cell renewal which results in dull, tired-looking skin. In addition to these two factors, frequent muscle contractions cause permanent lines on your skin that make you look old. Lack of hydration gives your skin a dry, rough look as well. When all these factors come together, your skin looks old and aged. Stemuderm fights against all these aspects and makes you look young and beautiful again. Its powerful ingredients address each of these aging problems and eliminates them, so you'll have young-looking skin again. The best part is Stemuderm gets to the root of the problem for longer-lasting results. Acetyl Hexapeptide-8 - This is a powerful ingredient that combines naturally-occurring amino acids to give you beautiful skin. It disrupts the pathways that send muscle contractions and this, in turn, reduces the appearance of fine lines. Dipeptide Diaminobutyroyl Benzyl amide Diacetate - This peptide relaxes facial muscles, so the fine lines that appear due to constant muscle contractions are reduced. So, no more laugh lines, frown lines and crow's feet. Acetyl Glutamyl Heptapeptide-1 - This ingredient also works to lessen muscle contractions and the subsequent wrinkles. Palmitoyl Oligopeptide - This ingredient adds strength to your skin, so it is in a better position to withstand free radicals and UV rays that tend to damage it quickly. Pentapeptide-3& Palmitoyl Tetrapeptide-7 (Matrixyl 3000) - Both these peptides boost the production of elastin and collagen to give your skin a smooth appearance. Malus Domestica – These are stem cells from a rare apple found in Switzerland. They repair any damage deep below the skin surface for optimal results. Jojoba seed oil - This oil is the only one in nature that is similar to the oil secreted by our skin. It has oxidative properties that nourish and moisturize your skin. Apricot kernel oil - This oil hydrates the skin and helps it to retain moisture, reducing flakiness. Squalane - Derived from olive oil, this product helps to create smooth and soft skin. Hyaluronic acid - This is a top beauty ingredient that reduces the appearance of fine lines and wrinkles and gives a plumping effect on your skin. These are some of the key active ingredients you can find in Stemuderm. As you can see, all the ingredients are highly effective when it comes to anti-aging and at the same time are safe to use for everyone. Such a rare combination is what makes this product so popular. Stemuderm has no side effects whatsoever because it is made from natural ingredients. These ingredients are added in the right proportions after extensive research done by some of the leading dermatologists in the world. As a result, it is completely safe to use for all skin types. In fact, many of these ingredients even have anti-oxidant properties and this makes it a great option for women of all ages. Overall, it protects the skin and prevents any harmful UV rays or free radicals from causing further damage. One of the best aspects of Stemuderm is that it is suitable for all skin types, including those that are easily irritated. It is best to purchase Stemuderm directly from the Solvaderm website. The advantage you get when you buy from the manufacturer's website is you see the other Solvaderm skin care products that complement and enhance its effects. 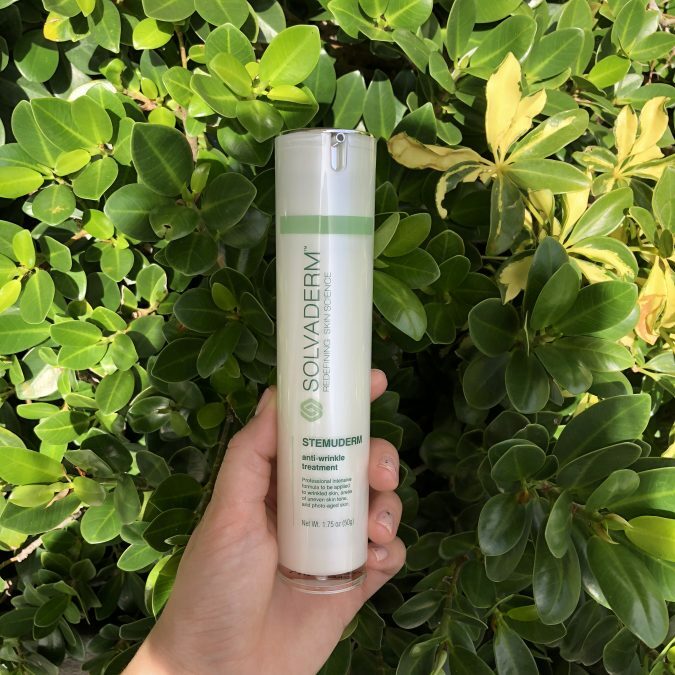 You can also read all about this product, its ingredients, directions to use, and all other information that would help you to know more about Stemuderm. The cost of Stemuderm is £61 ($79.99) for a 1.7 oz (50 ml) bottle. It is eligible for free shipping and the website often includes special offers and discounts. This price is very reasonable compared to many other anti-aging skin products or procedures such as fillers and injections. When you purchase directly from the website, your product will be covered by the 60-day money back guarantee. To conclude, Stemuderm is an incredible product that delivers what it promises. Its ingredients act on various aspects of aging and address each to ensure you have a young and beautiful looking skin that will last forever. To top it, Stemuderm is also reasonably priced when compared to other anti-aging treatments and the fact that it is convenient and easy to use adds to its appeal as well. In all, Stemuderm is a top anti-aging cream that is sure to blow you away with its results. Judging by the numerous positive customer reviews, it has done the same for many consumers around the world already.